Lucas Hnath’s popular revisiting of one of Henrik Ibsen’s best-known plays—A Doll’s House—receives two productions in Connecticut this season. First up, it’s at TheaterWorks, directed by Jenn Thompson, through February 24, and as the season closer at Long Wharf in May (the two productions are not related). On the intimate stage at TheaterWorks, on a set by Alexander Hodge that combines Ibsen-era furnishings with a modernist design of neon frames, a series of encounters that mark the return of the former Mrs. Nora Helmer (Tasha Lawrence) to the home she walked out of—so defiantly, memorably, and, one thought, irrevocably—are front and center. The force of the knock upon the door that opens the play relies on our grasp of how final that very door’s slam, back in the 1870s, had been. What follows brings to light all that was never said between the Helmers before, and much that serves to fill in the blanks of what has happened since Nora’s last appearance in the house. The knock is answered by the housemaid Anne Marie (Amelia White), shocked and surprised to see her old mistress, and the way the two navigate the great gaps in what they know of each other gets us off to a vivid start. Nora, who is dressed expensively in Alejo Vietti’s period costume, has much to pride herself on. She is a success—an author of novels for a dedicated female readership. When she treats Anne Marie to a quick précis of how her books attempt to blow the lid off the inequities of marriage, we’re glad of the housemaid’s subtly caustic responses. Nora has become rather pedantic, and it’s up to Anne Marie to express our lack of amazement in her views. White turns in a finely modulated performance: as the first character to use the profanity so automatic in our day, she deftly takes up a contemporary view that feels earned—and armed against Nora’s rhetoric. 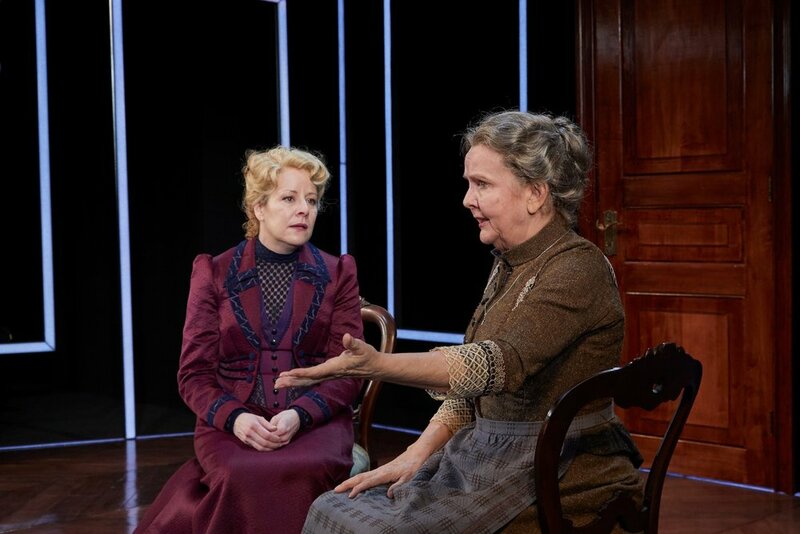 The question that would nag at an audience of Ibsen’s day (and ours)—what of the children?—shows up almost automatically as we listen to Nora justify her moves and her total remove from the lives of her two sons and a daughter, an infant when Nora left. Nora doesn’t want to make their acquaintance and wouldn’t be paying this visit at all but for a major complication. Though freed of the tasks of motherhood and the duties of a wife, Nora has recently found out to her dismay that she is still legally married to Torvald. This makes her guilty of fraud, to say nothing of being liable to charges of moral turpitude, for having conducted herself as a single woman all these years. When Anne Marie rebukes Nora for the fact that it fell to her to be the caregiver to her absent mistress’s children, we glimpse the class element in Nora’s privilege, a factor that doesn’t always surface in more celebratory receptions of Nora’s act of abandonment. The tension between the satisfactions of Nora’s rebellious act, in the original, and her status as a matter-of-fact business woman trying to get on with her career, in the sequel, lands as a look askance at how far she still has not gotten. That aspect of Hnath’s script plays believably as sequel, as Torvald (Sam Gregory), when we meet him, is as completely self-absorbed as ever. Gregory gets in a few nicely deadpan non-reactions to the new Nora, and, by the end, there is a grudging kind of rapport. That’s the note that resonates longest after the play ends; like a fulfillment of how children might wish their separated parents would find closure. Which brings us to the Helmer’s child, Emmy, featured in the play, in Kira Player’s strong performance, as a very self-possessed and decisive young woman, much more so, we should see, than Nora was at her age. And yet what Emmy is determined to do is marry, as if in contempt of all her mother has learned and achieved. While not quite a battle of wills, there is a sense that the two women are facing off over a vision of what fulfillment means and how to attain it. The subterfuges proposed on how Emmy might aid her mother in getting around her father (Torvald has no interest in giving Nora a divorce) give us more a sense of strategy than of character. There’s an odd tension between Hnath’s script and the naturalistic style of Thompson’s direction. The script’s rhythms, one senses, could be delivered without so deliberate a sense of a plausible social space somewhere between Ibsen’s time and ours. Any awkwardness in that overlay should be intentional but in the TheaterWorks production significantly abrasive tones rarely surface. Not even Torvald entering with a gushing head wound upsets the even-handed mise en scène. Tasha Lawrence plays Nora as a strong-willed woman with scant sympathy for what others might expect of her. She has struggled to attain her self-possession, so that relinquishing it for a more emotionally needy version of herself is not in the cards. Lawrence sheds tears only once, late in the play, and the brief loss of composure is telling. Nora has realized she’s freer than she had imagined, that—in the manner of a modern woman of the 21st century—she must make her way without the sentimental attachments that still cling to her in the Helmer household. The fact that Torvald, after all this time, is finally able to accept her departure doesn’t arrive as quite the heavy-handed moral it might have. Gregory does fine work as a man who, almost too old to care, can still be amazed by the way a woman—and that his wife—can shake him. Their closing dialogue is the best part of the play, which at times can feel like a scene trying to stretch itself into a full-length play. An interesting revisiting of familiar territory, Hnath’s A Doll’s House, Part 2 is never as striking or illuminating as one might like. It seems at times to run a checklist of possible complications while making sure its heroine’s heroism is never compromised by anything like regret.